The dawn of a new format has arrived, and we don’t yet have the tools to solve it. With EDHREC supporting Brawl with full functionality there was a need to create articles that sift through the information. Understanding a format takes time. The announcement was less than a week ago as I write this article. The resources we have available amount to a few words spilled across the Internet and a smattering of decklists. With that in mind this series is here to explore the evolution of the new EDH variant. Grab your draft chaff, suit up your singleton sixty card masterpieces, and get ready to Brawl. This article is a “Day Zero Primer” because we are in the dark statistically and most of us lack experience that could give insight into how Brawl functions on a macro scale. Because of what we know about EDH and Magic, the Gathering in general there are assumptions we can make to guide us. If we manage to parse through the jokes about Wizards of the Coast looking for a more marketable Commander format, then we get to a spot where you can see Brawl as something unique. The most important and exciting thing we get to do is dissect the challenges that we have not faced before in a Commander format. Card Selection is an important difference we have in Brawl. Not simply because the power level of some cards are lower, or there isn’t an endless supply of infinite combos, but because it offers unique choices. When you have a pool of cards that doesn’t include the color-pie hot-mess of Time Spiral block then you are required to follow the natural deckbuilding restrictions of color choices. Choosing mono-colored commanders chokes off at least one game function for you and may force you to make political decisions about who you align yourself with. Ghalta, Primal Hunger seems great in a powered down Commander format. When you must play only green cards from the last few sets that comes with a lot of costs. You do have access to plenty of mana acceleration in Hour of Promise or Thunderherd Migration, but you have no wraths and virtually no way to rid yourself of gods. As we will touch on later this pigeon-holes you into a linear strategy. That isn’t a bad thing per se, but it is a restriction you need to keep in mind as you build. 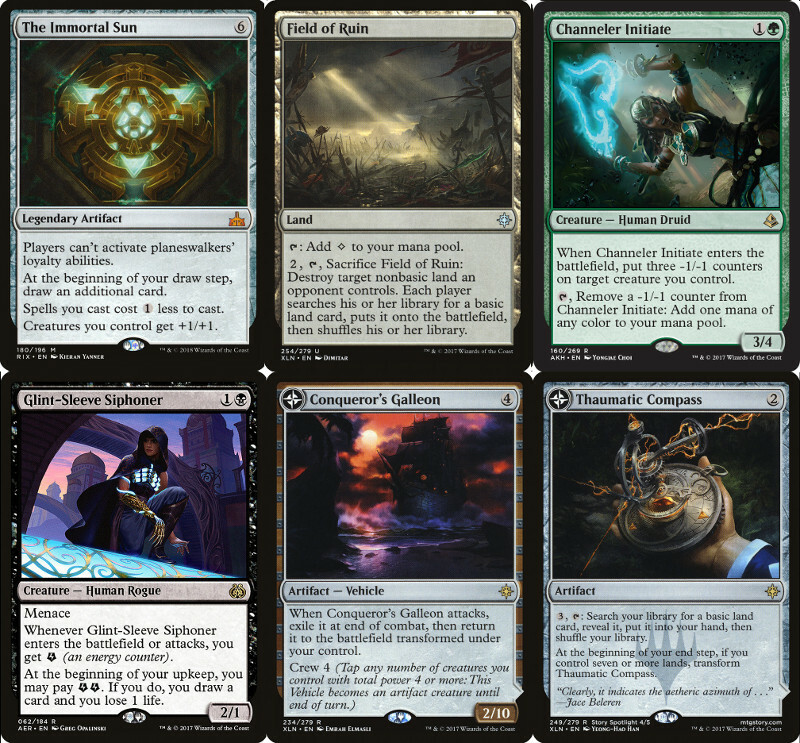 Black-white and green-blue seem like strong pairs considering their options for commanders are capable of being versatile or linear depending on how you build. The color pie restrictions placed upon ramp/fixing is possibly the most pronounced. This is a format where, besides Cultivator’s Caravan, Manalith and may be the most versatile option to ramp and fix you. That is a huge change that that may give Dana Roach an aneurysm. I have seen a few lists out there already that try to get by playing six-drops with no colors and only 23 lands. This is a huge mistake. Stuffing a deck with 27 or 28 lands will be common, I think, but 25 is probably the floor unless your curve ends around 4 converted mana cost. Games are going to run long, and you want to ensure that you hit every turn until you get to your top end. You will see a running theme in the article, but defensive speed will be important in this format, and you have no defense if you don’t make your land drops. 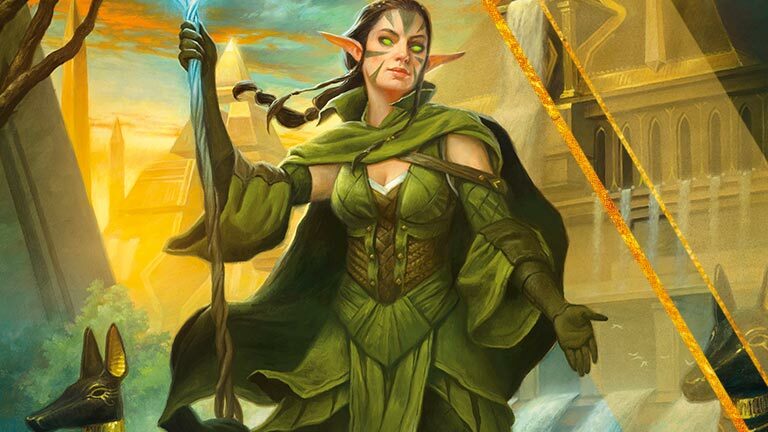 Green, as makes sense, has a lot of choices for ramp and fixing, but there are a ton of fantastic commander options that don’t involve green. For instance Admiral Beckett Brass may be popular (as I expect all the Ixalan tribes to be) and in my list I chose to run Traveler’s Amulet, a card that I rarely run in limited! However, it is an integral part of ensuring you make land drops and that they are the right colors. Primary colors while splashing the rest is not something common to the EDH we know, but here it may be the norm. In EDH I play decks with varied win conditions. Adapting to a wide verity of hate and strategies you face in a multiplayer Commander game can be pivotal in a tight game. Effectiveness against a wide field is important. Brawl will feel different, at least at first. You are still facing off against multiple strategies at once, however the hate is not as versatile and the meta is unknown. This is the perfect breeding ground for linear strategies to do well. Matt Nass did well with a Krark-Clan Ironworks in a Modern meta that wasn’t expecting it and in this new Brawl meta nothing is to be expected. This doesn’t mean that the only strategies to play are linear ones, but they will be very good places to start. Graveyard strategies could do very well in the opening meta of Brawl. The Scarab God is a force to be reckoned with and is already a mainstay in EDH. The hate against The Scarab God isn’t very powerful or versatile. This means that non-graveyard decks should probably run hate cards like Silent Gravestone, but it could be hard to justify. In many games a Gravestone is at best a five-mana cantrip. Other hate is available to run against The Scarab God but the best thing to beat it may just be to race it. After all this standard format is known for having terrible hate. If this is the case this there may be a bit of back in forth in the beginning of the format from linear decks and control decks. As I said before, defensive speed will be important. This all may sound a bit contradictory with itself, but that is the important part. If it does contradict itself that could be the signs of a healthy metagame. Players, like any meta-game, will have to figure out if the other people at the table will play with answers, or simply try to race. Which answers will they choose? Blood Sun seems to be one of those cards that is a great hate card (it replaces itself and handles most situations at an easy cost), but the problem becomes who exactly would this effect in the meta? Artifact decks trying to tutor their win condition with Inventors’ Fair? Be Aggressive! Be, Be Aggressive! With life totals at 30 you’d expect wizards is looking to make this format more aggressive. I think that’s an easy and correct assumption to make. What is also an important part of this is the 60 card decks instead of 100. When you run 60 cards you can rely on drawing your lower CMC creatures earlier. Of course, if you make the ratios similar in a 100 card deck the results will be similar, but your best early threat you will draw more often in a smaller deck. The other reason why aggression is important is because of the relative power level of creatures versus spells in the Standard meta. Creatures are much more powerful than spells even at lower costs. Your opponents must run cheap removal (which can be less useful later in the game), run more mass removal (which is relatively hard to come by), or run their own creatures. You only have access to one Fatal Push. Creatures in the developing stages of the game will be the status quo versus the mana rocks you see in EDH. Playing ramp, ramp, ramp in Brawl could put you too far behind if the threat you are working towards doesn’t completely take over the game. That’s a fine question: which cards are going to take over the game? Many key format staples in Brawl will have one important commonality with EDH, colorlessness. The Immortal Sun has been a boon in the big brother format, but here it is likely one of the most important cards to own. It gives those creatures that you will want to play a boost, it’s one of the best form of card advantage for all colors, it helps costs including the pesky commander tax, and it hates on half of the commanders that will see play. It is hard to understate how much I think this card will warp the meta around it until it leaves. If this format has a financial effect on anything it will be this card. Field of Ruin also happens to be colorless, but as a land that fixes your colors and deals with some of the other best cards in the format, flip lands. There is almost zero reason not to run this in any deck. The only possible downside is if you don’t draw your third land, and you probably were in trouble anyways. Channeler Initiate is one of the best ramp cards you can run in any green deck. One of the worst parts about running mana dorks in EDH is how much mass removal runs around that format. That is not the case here. Your mana rock likely won’t be enough for your opponents to want to pull the trigger on a precious Fumigate. It also protects well in the early game and can be a big beater later. Glint-Sleeve Siphoner is not much of a surprise here. This card does some work in standard and in a format that requires card advantage to stay alive it’s one of the best ways to do so in the color. Almost all the Flip lands will be playable in some way or another. The most distinct ones will be Conqueror’s Galleon and Thaumatic Compass. The Galleon provides fantastic utility and a great source of card advantage for any color. The Compass fixes in a format with little fixing and will deal the worst threat at the table after your mana is perfect. This list could be a lot more comprehensive. This is really just the ones I have a strong feeling about. The EDHREC crew did a big article on our favorite cards of 2017 (http://articles.edhrec.com/top-10-edh-cards-from-2017/) and that will cue you into other potentially fantastic options. Mirage Mirror and Sunbird’s Invocation are two cards on my favorite of 2017 list that may not be as good in Brawl’s meta. Those two cards specifically rely on the power-level of other things in the format. That’s not to say it’s bad to turn your Mirage Mirror into a Etali, Primal Storm one turn and protect it the next from Naturalize by turning it into a land the next. However, they may be more build around here than they have been. You will need to find the right decks that can abuse them appropriately. Nissa, Steward of Elements is one of my favorite planeswalkers in this set for the commander. She is great early and late. Her ultimate can be used to finish games on a locked board. When you can flip powerful creatures with her minus ability it feels great, but flipping mana dorks also helps set up for the next time you cast her or one of your big “X” cost spells. Let me know if you think I’m missing anything from the list. Many speculate on the lifespan of Brawl, but I prefer to ride the wave and see where this thing will take us. There is clearly a lot of excitement about something new coming to casual play. It feels familiar yet fresh at the same time. I plan on writing this series for the foreseeable future and am excited to rumble with some people. Let me know what you think of my Zero Day assessment. You can talk to me on twitter about it @rickworldnews. Give me a comment below about what you are playing. I love seeing lists and will be scouring them when they go live on EDHREC.